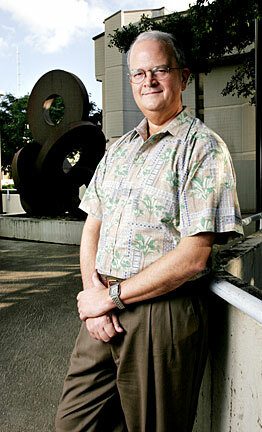 Vance Roley has ambitious plans for the University of Hawaii College of Business Administration. Roley, who posed Wednesday outside the college's building on the Manoa campus, is launching new programs and working on increasing endowment support for faculty. Question: How did recent accreditation visits go? Answer: All indications are that everything went well. Apparently this one went as smoothly as can be expected. One of the issues that we had that we knew about, we had a lack of tenure-track faculty. That number has declined in the past 10 to 15 years because of the lack of public funding, but UH is not unique in this. We added five faculty last year so we've turned it around. » Born in San Mateo, Calif.; raised in Vancouver, Wash.
» Old job: Acting dean and the Hughes M. Blake professor of finance at the School of Business at the University of Washington, where he had worked since 1983. » Spent a year as a senior staff economist in the Carter administration along with now-interim UH President David McClain. Q: Do you need to add more? A: We'd like to get it up to the mid-60s again. We are currently at 51. We were down to 45 to 46, somewhere in there. Part of the challenge is that we have to find some revenue sources to do that. We're hoping to generate some new programs that will generate the revenue where we can hire the new faculty. So that's one piece of the puzzle, but the other part is endowment support. These are fellowships, professorships and chairs for the faculty. That's what I'm spending a lot of time on now, trying to think of new programs that we can launch that can generate the funds to hire new faculty and endowment support to retain them. Q: What new programs are you trying? A: This is something that we're relaunching: We're expanding our MBA to the neighbor islands. The thing we're doing this time is we're going to broadcast a live MBA class. We're going to connect Maui, Kauai, the Big Island and Saipan. The marginal cost is small because we're using an existing class. It's generating a revenue stream for us and it's an opportunity for those on the neighbor islands to get an MBA. We're going to launch this in January 2006. Q: What else is happening? A: We had a gift of a $100,000 and we had a match, so we have $200,000 to invest now in career services. We're going to invest in additional staff. We have two full-time people running career services. We're also going to invest in some interview rooms within the business school facilities, making a more professional setting where businesses can come and interview our students. Q: With unemployment low, it's probably a good time to be a senior. A: We have firms coming in here all the time who are anxious to interview our students. The demand is very high right now. Enrollment is still going up. A: Another thing we're investing in is our entrepreneurship program. I inherited a program that had a strong base across the entire college. The entrepreneurship program has two endowed chairs -- the Barry and Virginia Weinman Distinguished Professor of Entrepreneurship and E-Business, and the Harold and Sandy Noborikawa Endowed Chair in Entrepreneurship -- and we're trying to hire some more junior faculty. There's a real push here to try to get a more diverse economy on Oahu in particular, and we think we can play a role in that. There's all this talk about life sciences, and the information technology community here is strong. I really believe firmly that we have to look at other areas of strength here in the UH campus. This allows us to reach out to others in science, engineering and other places. Q: How much endowment support do you need? A: I would like to have half of our faculty have some endowment support. We have six chairs and 50 faculty. That's quite a lofty goal for us. But to compete in the market for faculty, that's the kind of endowment support we need. Q: I understand you worked for the White House in the late 1970s? A: It was a really interesting job. I learned a lot about government, about policy. The economy was in turmoil, we had recession, oil prices going up, inflation the highest it's been in 30 to 40 years. And unemployment was high. So, it was,"Now what should we do?" There was nothing to work from in the past. Q: What do you think of outgoing Federal Reserve Chairman Alan Greenspan's approach to interest rates? A: I thought his approach was really, really good. Going back to this period in 1979-1980, the Fed was intent on following rules in a pretty rigid way and I think that added to some of the problems. Under Greenspan, they looked at economic models but they looked at lots of other things as well ... and it really worked well. Inside Hawaii Inc. is a weekly conversation with business and community leaders. Suggestions can be sent to business@starbulletin.com.